My husband the number theorist goes to conferences which are well-attended by people who do mathematics for the National Security Agency. Many of them will tell you they really enjoy their work, but they can never give any talks about it. That's how I feel about working on my sock design; I'm having a grand time, but it doesn't make for interesting blogging. When I say "grand time," it actually reminds me a lot of taking narcotics. I'm hyper, euphoric, insomniac, and just a little nauseous. I'm on my fourth iteration of the heel. The first time was like a rough draft, just to see how the pieces fit together. Then I did a whole bunch of high school algebra to figure out the numerical relationships between the stitches and rows of the various sections. I also demonstrated that there was only one degree of freedom, which means that it's okay to pick the number of inner ankle gusset increases to be anything I want, but then all the other numbers are determined by that one (no more free choice). While I was knitting up the Math on a Recycled Envelope, I tweaked the construction details, substituting kitchener stitch for a section of narrow short rows, which produced satisfactorily stretch and mysterious-looking ("How'd you do that?") heel, so now I'm just tweaking the fit. 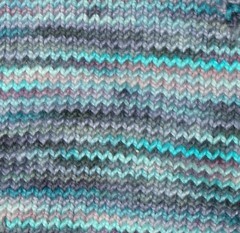 I have to knock off the tweaking pretty soon, though, because in seven days I'm leaving for Knitter's Connection! My friend Peg and I had some headaches with registration, but in the end, we are both taking two whole days of class with Cat Bordhi. It's important to me to have a finished sock with me, not a pile of sock ramen and a better idea. 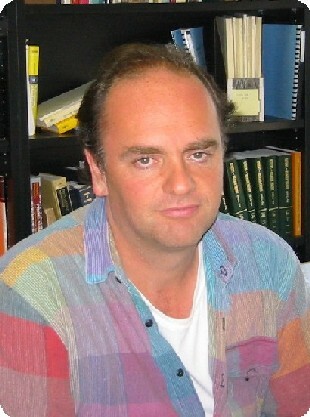 Oh, and because blogs should have photos, here's one of a famous number theorist. Does his shirt say "Kaffe Fassett influenced" to anyone but me? 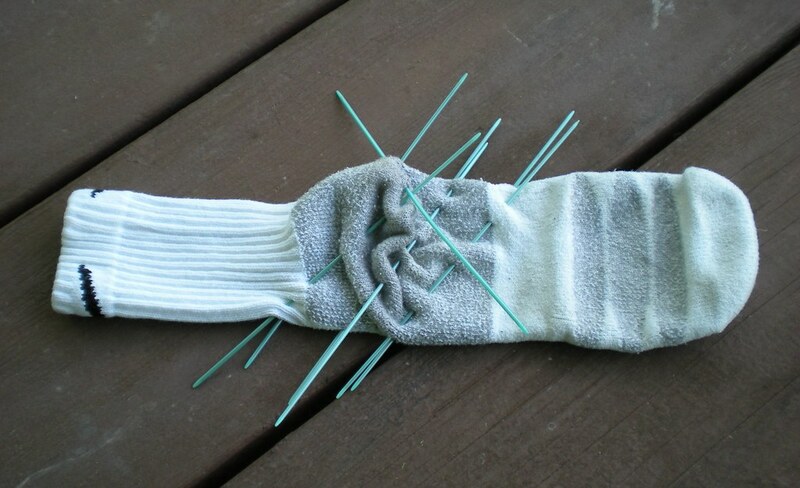 So it's immediately obvious that this is a useful tool for creating an unconventional sock architecture, right? I'd had a creative inspiration for sock architecture several months ago, but I never figured out quite how to work the heel. Last night while I was trying to fall asleep, I suddenly had an idea about how to go about solving the problem: mark up an actual sock! The house was dark and my husband was asleep already, but luckily there was a load of whites wrinkling in the dryer, so I fished out one of his white socks. Sadly, there wasn't one with an incipient hole, and I grudgingly admitted to myself that I ought not to draw all over a perfectly good one with a laundry marker. So I used double pointed needles to mark parallel lines to help me figure out where to place heel shaping elements. Then I stayed up way too late knitting on my prototype. I'm taking (hopefully-- still waiting for confirmation) a class with Cat Bordhi in seventeen days, and I'd love to have this prototype completed to take with me to show off. I can't post a photo of the WIP because that might interfere with submitting the design for publication, but I'll share a closeup of the yarn knitted up because it's Ooh Pretty. It's a Claudia Hand Painted Oops, which is a shame because I'd be tempted to buy more of it.